This weeks setting is a new configuration setting in Offline Files called “Exclude files form being cached”. This setting can be used by IT administrators to block any un-wanted file types from being made available for offline use. 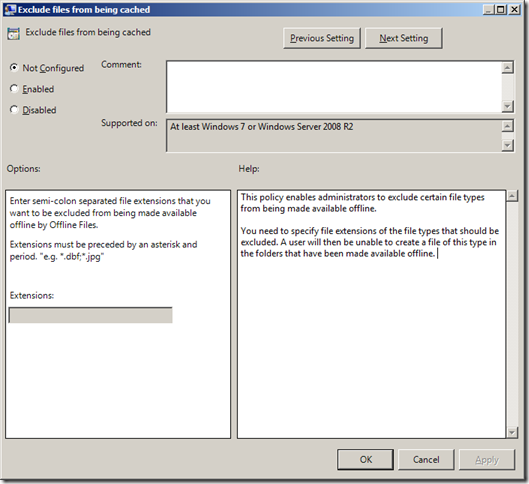 You can find this setting under Computer Configuration > Policies > Administrative Templates > Network > Office Files and it will only work on Windows 7. This setting can be really useful when you have user policies in your environment that block certain types of files on your file servers such as *.jpg or *.mp3. When combined with Windows Server File System Filters you can use it to make some very tight controls on your corporate file servers. do we have simiar to exclude particualr folder from being cached.